Gene Gill was born in Memphis, Tennessee and received his Bachelor of Fine Arts Degree from The Chouinard Art Institute (now called The California Institute of the Arts). He has exhibited widely in the Los Angeles area since 1970, in group shows and one-man exhibitions. His paintings and graphics are included in the permanent collections of the Los Angeles County Museum of Art, The Palm Springs Desert Museum, Container Corporation of America, Atlantic Richfield Corporation, Northrop Corporation, and the Ronald Reagan Presidential Library. In addition to his career as an artist, Gene Gill was an art teacher with the Los Angeles School District for 25 years. 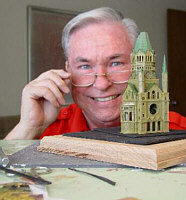 Gene Gill builds one-of-a-kind miniature models of historical landmarks. 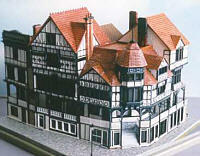 Each miniature is the product of careful research which includes a personal visit to the original landmark for on-site sketches, measurements, and photographs. Back in the studio, the artist utilizes these resource materials to hand-craft each piece in mixed-media. The range of media includes the traditional wood, sculpey, and styrene, as well as whatever else may work. 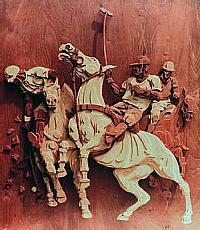 It is not unusual for some miniatures to contain well over 3,000 individual pieces. 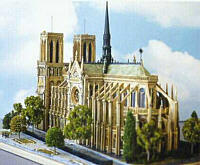 The average height of these replicas is an astonishing four inches and can take the artist many months to build.